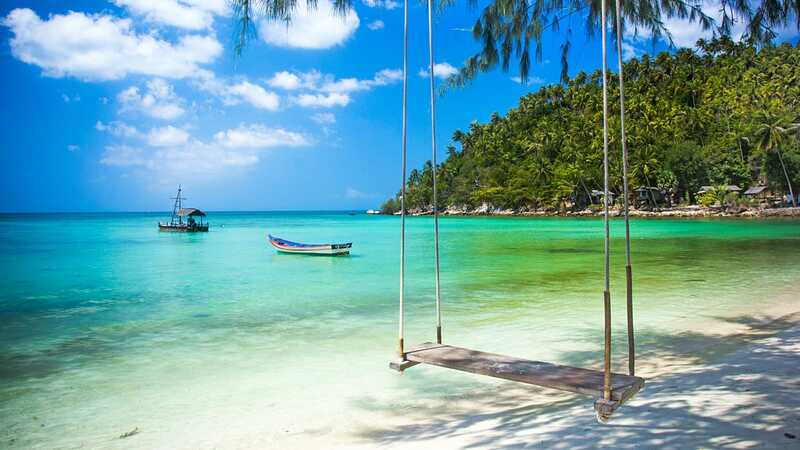 Home » Koh Samui, Koh Phangan and Koh Tao – which island is for you? Hi, this is Eva again, Thailand Specialist at Fleewinter. Clients often ask me what the differences are when it comes to picking an island in the Gulf of Thailand. Koh Samui, Koh Phangan or Koh Tao? Which island offers what, and what is so special about it? So we thought it was time to talk about the characteristics and differences of the island trio in the Gulf of Thailand. The Samui – Phangan – Tao trio is a great beach destination during the European summer. On the Andaman or west coast, where Phuket, Krabi, and the Phi Phi Islands lie, the southwest monsoon brings storms from April to October, while on the Gulf of Thailand, where Koh Samui, Koh Phangan, and Koh Tao are situated, the most rain falls between September and December. For this reason, I usually recommend the east coast to my clients looking for a beach getaway in June, July or August. But which of the three islands is the right one for you? The three islands are surrounded by turquoise water and beautiful beaches, but each of them has their own vibe, and this is important to know if you want to get the right amount of holiday for your bucks. Even if you decide against staying on Samui, you will inevitably step foot on the island as it is the gateway to the other two, being the only one with an airport. This makes it the most convenient island to travel to, but also the most touristy one. It is the biggest of the three islands, certainly the most developed where all the major hotel chains have settled. Here, travellers will find all kinds of accommodation, from upscale beach resorts as well as mid-range hotel to backpacker-style hostels. The island caters pretty much to anyone, from party animals to yogis. The party headquarter is Chaweng, a touristy (and not very charming) town, comparable to infamous Patong in Phuket, where you will find a myriad of nightclub, bars and massage parlours to keep you entertained. I found it interesting to stop by this area but certainly wouldn’t enjoy staying there if I was looking for a relaxing holiday. The beach is long and beautiful, but comes with a crowd. Lamai is similar to Chaweng, but on a smaller scale. The beach is long and beautiful and the sunsets are gorgeous. I didn’t find Lamai particularly charming though, and didn’t like the traffic. I haven’t been to Koh Samui in the high season but can imagine Lamai getting very hectic. Bophut is a beautiful bay with lovely boutique hotels and a charming fisherman’s village with little cafes, bars and shops – certainly my go to bay when clients ask me where to stay on Koh Samui. I especially like the hotels at both ends of the bay where it is a lot quieter. However, the beach is nice but not as good as the Chaweng or Lamai beach. The area around Big Buddha has a nice vibe, the right amount of restaurants and bars, but aren’t as good if you are a beach bum since some parts of the beach are quite rocky. The further away one goes from the airport, the less developed and the more jungle like the island gets. We drove all the way down south where the roads get muddier. It is a lot quieter here and we loved it, however the beaches weren’t as good as the ones in the north. 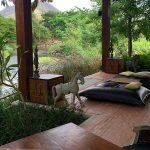 This is where you will also find some fabulous yoga and detox retreats. There are some exclusive super luxurious hillside resorts which are stunning and offer gorgeous views, however the beaches where these are located are so so, unfortunately. If you are looking for amazing views and don’t mind driving 15 minutes to the beach, I recommend properties located in the middle of the island. You save some pounds and the views for sunset are unbeatable. In general: Koh Samui is the most touristy one of the Samui-Phangan-Tao trio, with the widest variety of luxurious accommodation and first-class resorts. It also is the most accessible. There are certain areas to be avoided if a relaxing beach holiday is what you are after. Koh Samui wins the points if a beach holiday is not complete for you without a little party and shopping. While Koh Phangan has many different faces, all of them live up to the island’s hippie-at-heart atmosphere. It has a reputation as party head quarter because of the legendary full moon beach parties in the Hat Rin area, but this really is only a small part of the island. There is a yogi and vegan lifestyle scene around Srithanu in the north west of the island. There are no luxurious hotels in this area but the beaches are gorgeous and the sunsets are stunning. If you don’t mind to stay in a simple Thai style bungalow, you will be rewarded with beachfront accommodation for only little money, empty white beaches and a relaxed vibe. There aren’t many bars, but it is just the right amount to enjoy a few drinks at night, but not enough if you are on the hunt for the party of your life. While the island’s bigger sister Koh Samui is fully developed to offer all the luxuries of 5-star travel and has attracted numerous hotel chains, you will find beautiful boutique hotels with an authentic character on Koh Phangan. The island’s most luxurious boutique properties are located in the north east, on Thong Nai Pan Noi Beach, a quaint little village with a few restaurants, beach massage huts and a gorgeous beach. This beach is popular among couples and families alike. In general: If you are looking for a great white beach and a place to relax, then head to Koh Phangan instead of Koh Samui. The „middle child“ definitely wins the points when it comes to beaches. But, if you are not in the backpacker age any more but still enjoy a good long night out, then Koh Phangan may be a bit too quiet for you. I love the smallest sister of the trio, but opinions are definitely divided here. Koh Tao is the Berlin among the islands, it has this alternative feel. It is edged with beautiful beaches, bays and picturesque sceneries, and small cafes and restaurants offer an impressive choice considering the size of the island. This may be the reason why it seems to be popular among backpackers. But, I have left my backpacker years behind me a long time ago, and I had the most amazing time. The island is hilly and steep offering an interesting landscape wherever you go. Because of its stunning coral reefs, its abundance of marine life in clear, warm water, the island is especially popular among scuba divers. The island is rocky and hilly, and is best explored by motorbike. When it comes to beaches, Koh Tao does lose points though. They aren’t as white and beautiful as one can find on Koh Samui or Koh Phangan, plus the best ones charge an entry fee. Accommodation is mainly basic, there are none of the bigger chains. However, there are a few luxurious boutique hotels that are definitely worth to be checked out. In general: Koh Tao has an edgy character and, even though small in size, is a lovely island to visit. It has great food options and picturesque villages. If you want to laze at the beach all day or party all night long, it may not be the perfect choice, but if you are into snorkelling or diving, enjoy beautiful sceneries and have a sense for adventure, this may be the perfect island escape for you. If you are planning a trip to Thailand, in most beach destinations it really comes down to where you are staying. We have spent months checking out the islands and beaches, searching for the best boutique hotels, in order to be able to give our clients the experience they are looking for. Honest inspiration is what we are providing at Fleewinter, we know when to say no and when to say yes. If you are interested in finding the perfect hotel for your well-deserved holiday, then send an email to thailand@fleewinter.com.